There are many ways to green up any business, large or small— and an added benefit might just be saving money. Just like individuals, businesses can measure their carbon footprints to get a sense of where they are starting from and to get some initial ideas of areas to focus on to reduce greenhouse gas (GHG) emissions. The U.S. Environmental Protection Agency offers a free “Simplified GHG Emissions Calculator” to help small businesses get started. Another option is to enroll in TerraPass’s “Carbon Balanced Business” program, which helps commercial entities measure then offset the GHG emissions they are responsible for generating. Beyond carbon footprints, there are many other things businesses can do to minimize their environmental impacts. 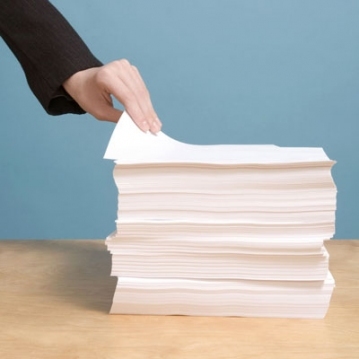 The non-profit Natural Resources Defense Council (NRDC) reports that, first and foremost, businesses should shift the paper paradigm—the average office tosses out about 350 pounds of paper per year per employee. “Reducing your waste and purchasing paper with post-consumer recycled content can help save trees and nudge the pulp and paper industry, one of the most environmentally destructive industries in the world, toward a less damaging path,” NRDC reports. Some easy ways to do this include: setting printers to use both sides of a page (or designating a “draft tray” filled with paper that’s blank on one side); buying copy paper with a 30 percent or more post-consumer recycled content; collecting used paper separately for recycling; and stocking bathrooms with postconsumer recycled tissue products. Getting more energy efficient is another way to save the Earth while saving money, too. NRDC recommends taking advantage of the fact that most utilities offer free or inexpensive energy audits, whereby an engineer examines operations and provides a report about how to save on energy costs. Lastly, when shopping for new office appliances, look for the EnergyStar label which means that the federal government has rated the particular unit highly in terms of energy efficiency. Cutting water waste will also make a business run greener. The group says to install faucet aerators and low-flow toilets, check for and fix leaks, landscape with water efficiency in mind and recycle gray water where applicable for nonpotable uses, such as watering gardens. CONTACTS: EPA, www.epa.gov/ climateleadership/smallbiz/footprint.html; NRDC Greening Your Business, www.nrdc.org/cities/living/gbusiness. asp. EarthTalk® is written and edited by Roddy Scheer and Doug Moss, and is a registered trademark of E - The Environmental Magazine (www. emagazine.com). Send questions to: earthtalk@emagazine.com. Subscribe: www.emagazine.com/subscribe. Free Trial Issue: www.emagazine.com/trial.